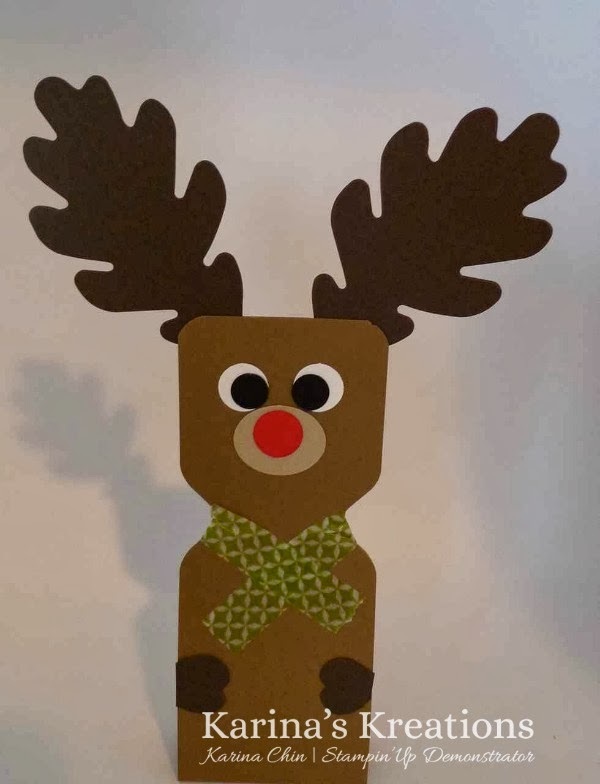 Karina's Kreations: Stampin'Up Envelope Punch Board Reindeer Treat Holders! Stampin'Up Envelope Punch Board Reindeer Treat Holders! I wanted to show you how to make these fun Reindeer treat holders. I made a quick video for you to watch but I forgot to add the hoofs on my video sample. I used the Pansy Flower punch and trimmed it down to look like a hoof. The dimensions of the project are 2-1/8"x 11" scored at 5-1/8" and 5-7/8". The punches are the small oval, 1/2" circle punch and the circle from the Itty Bitty Shaped Punch Pack. I hope you make these for your friends they are fun!! !